Denisovans are the most mysterious species in the human family, known only from DNA found in a few fossil fragments. So we know their entire genome, but not what they looked like1. As such, we have no idea when or where they lived (aside from Denisova Cave, the one site we’ve found their DNA). Which means it’s impossible to link them to any artefacts. What tools did they make? Did they create any cave art? What did they eat? All questions we can’t answer. At least, until Jacobs et al. published the first thorough chronological record for Denisova Cave. Now, we can finally associate Denisovans with some archaeology, shedding light on their lives1. It turns out they were artists; responsible for symbolic objects never before seen in the region2. Denisova Cave has been studied since the 1990s. In all that time, countless research has been published about it; all of which reaches the same conclusion: it’s a bloody complicated site1. Now, we weren’t completely in the dark. Carbon dating has given a minimum age for the cave of 35-40,000 years ago2. Meanwhile, OSL dating gives us a maximum age of ~282,000 years ago1. But what happened in between? We had no idea. Well, not quite. We knew Denisovans, Neanderthals, and us, all occupied the site at one point or another. But that just means that anyone could’ve made the artefacts found in the cave. To figure out was going on, archaeologists had to go through layer by layer, dating and constraining each occupation phase. Many of these layers were all jumbled up and confusing, with each often requiring a different dating technique1. You know, just to make things extra difficult. But scientists are awesome, and Jacobs et al. especially so. They revel in challenges that require thoroughness and exhaustive documentation. That’s why science works. And so, after spending 4 years gathering 92 samples with a combined total of more than 280,000 measurable items; they finally had a chronology for the cave1. Much like the cave itself, the timeline of Denisovan/Neanderthal occupation is very messy. So rather than trying to describe it with stupid words, I’ll use this handy timeline instead. In summary, Jacobs et al. found Denisovans occupied Denisova Cave fairly consistently. As they should, it has there name on! However, there were also brief periods where Neanderthals showed up. Whilst there was never an example of a clear overlap between the two species, there is evidence they were living in close proximity. Notably, fossil 1 is the famous half Neanderthal, half Denisovan kid1. Could “close proximity” include sharing Denisova Cave? As well as hammering out the chronology of this cave, solid dates for the Denisovans allows us to reliably link them to tools and technology for the first time. 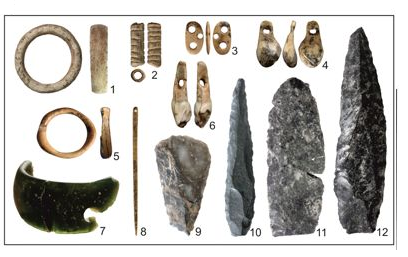 For the most part, they were using typical Mousterian tools. These were common during this period, also used by contemporary Neanderthals and modern humans1. In the more recent layers, modern humans arrive in the cave and bring with them a whole host of new technology. But just before then, a few new artefacts appear1. Specifically, archaeologists have found several engraved animal teeth and shells; many with holes drilled in them so they could be threaded into a necklace or bracelet1. Or maybe to make a cool hat. Whatever the purpose, nothing like this existed in the region before then2. 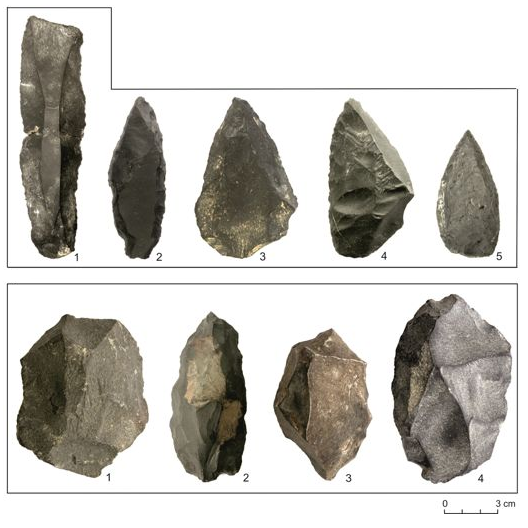 These artefacts were carbon dated by Douka et al., publishing in the same edition of Nature (and with many of the same co-authors) as Jacobs et al. Whilst some of were young enough that modern humans were clearly responsible, not all were2. Could Denisovans be the artists behind those older artefacts? Well, the dates do line up; suggesting they’re around 45,000 years old, which is around the same age as the youngest Denisovans at the site2 (although the cave’s messy stratigraphy make some skeptical that’s the fossils’ true age1). Interestingly, that’s also around the time modern humans were arriving in the region2. Could we have been involved? Perhaps this art was the result of trade, collaboration, or maybe theft. Or perhaps it was all their own idea and are annoyed at modern humans taking all the credit. And after we had the gall to take their cave as well! Jacobs, Z., Li, B., Shunkov, M.V., Kozlikin, M.B., Bolikhovskaya, N.S., Agadjanian, A.K., Uliyanov, V.A., Vasiliev, S.K., O’Gorman, K., Derevianko, A.P. and Roberts, R.G., 2019. 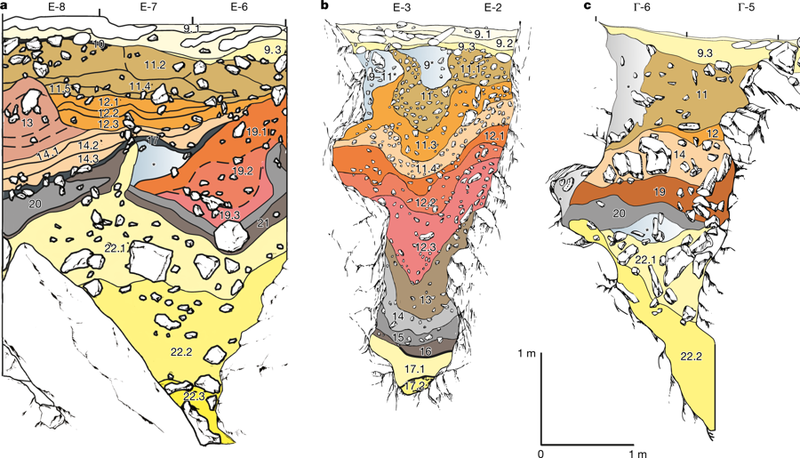 Timing of archaic hominin occupation of Denisova Cave in southern Siberia. Nature, 565(7741), p.594. Douka, K., Slon, V., Jacobs, Z., Ramsey, C.B., Shunkov, M.V., Derevianko, A.P., Mafessoni, F., Kozlikin, M.B., Li, B., Grün, R. and Comeskey, D., 2019. 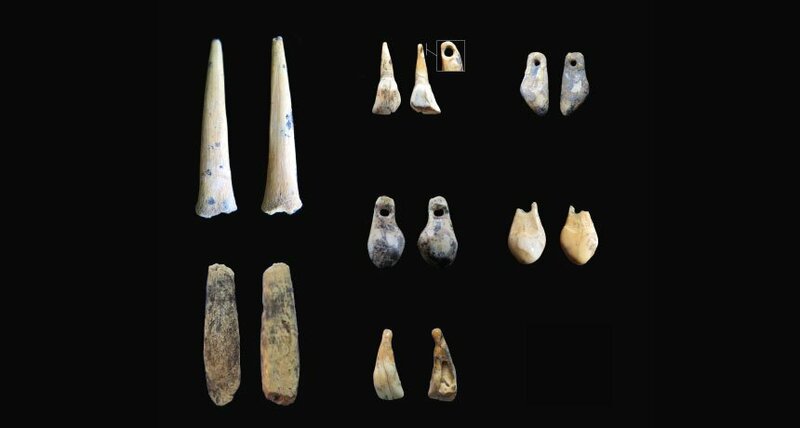 Age estimates for hominin fossils and the onset of the Upper Palaeolithic at Denisova Cave. Nature, 565(7741), p.640.